F. Corbin Moister Jr. was born in 1950 and joined ALPCA in August of 1968. He began collecting in 1957 while still in the third grade. An article in the Saturday Evening Post about Philip Hatch (ALPCA member #7) got his interest. He convinced his parents to take him to meet Phil. There he saw plates hanging from every nook and cranny of Phil's barn and from that day on Corb was hooked with this collecting mania we call license plates. Phil gave him a card about ALPCA but it took nine years to join our fraternity. Raised in Vermont and educated at Lafayette College in Pennsylvania Corb has wandered all over North America in search of plates. His initial goal to complete state runs from every U.S. state and Canadian province/territory has exploded into one of the most complete North American collections ever assembled. While not a motorcycle plate collector Corb assembled a complete 1950 birth year run of cycle tags. Birth year runs are a great collecting ideal but when you start them fifty years later the challenge is daunting. 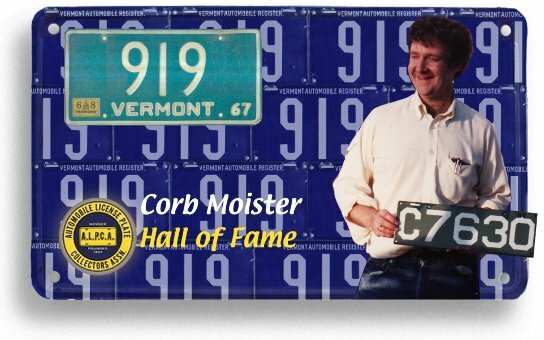 Corb has been a presence at regional meets, national conventions and plate auctions everywhere. He once said of ebay that it was like going to a plate meet every day of the week. That is devotion and when Corb gets involved in a project you know it will be done right without fanfare and with an eye toward financial responsibility. Corb served as ALPCA Director from 1984-1989 and continues to offer advice and guidance to collectors everywhere. In his initial campaign promotion in 1984 Corb wrote, "ALPCA contributes a great deal to every member's enjoyment of the hobby of license plate collecting." In April 1995 Corb wrote part II of the history of Vermont passenger plates covering 1910 to the present for the ALPCA newsletter. In his quiet unassuming way Corb has made a difference in the lives of numerous collectors new and old through his knowledge, tenacity and willingness to offer guidance. Corb pursued a career in banking operations and more recently has been a volunteer to numerous charitable and historical trust organizations in Vermont. A resident of Norwich Vermont he continues to pursue the best examples of plates he can find. For his outstanding dedication to ALPCA the Hall of Fame is privileged to welcome F. Corbin Moister Jr. to its ranks.